What’s the difference between autoresponder marketing and email marketing? And which should you use? Well, it depends on your intention. The company that I worked for had a very effective training program for their sales reps. They didn’t put you out on the street until you were ready. And you were ready for almost anything when you got out in front of people. They taught that your success as a sales rep in the trucking business was directly related to how effective you were in developing relationships with clients. Everyone promised service. Pricing was usually competitive and everyone was ready to negotiate. It often boiled down to who … which sales rep … the decision-maker liked most. Not which company they liked most. But it was important you understood that there were two different sales strategies depending on where you were in the process. If you didn’t know the customer or had just met them, your intent was simply to get to know them. Ask them out to lunch. That always got results. Develop a relationship. Then ease into trying to get their business. Now when it came to dealing with people who were already your customers … who you were already doing business with … it was a different dynamic. Sure, you still took them out to lunch. But maybe even a more expensive dinner. Or a sporting event. And the dialogue was different. You talked about business you were already doing with them. What additional lanes you could get. What additional product and service offerings you could give them. And you were trying to retain their business as others were trying to take it away from you by doing the same things you had done to get the business in the first place. So what does this have to do with autoresponder marketing? EVERYTHING. Autoresponder marketing uses a series … usually 7 to 10 … of emails which go out automatically one after the other to a prospect. Someone who has requested something for FREE … information they consider valuable … in exchange for their email. Autoresponders are written and loaded into an email service and then sent out … on a pre-determined schedule … without you having to do anything else. The goal is to provide a series of links which get the click back to a sales page usually. 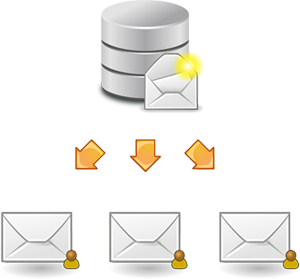 Autoresponder marketing has one main aim. Develop a relationship with the person who gave you their email address. By developing that relationship, you’re trying to get them to click on a link back to a sales page. Email marketing … the way I describe it to people … is when a marketer sends out timely emails that have just been written. These can be something like a link to a brand new product or to a brand new blog post. There’s not a pre-written series. It’s fresh content each time an email goes out. These emails work well for people who’ve already bought from you … customers. Email marketing is best done with people who you’ve already developed a relationship with and may be interested in more offerings. Autoresponder Marketing or Email Marketing? · If you’re talking to prospects … people who’ve opted in and given you their email address … you want to develop a relationship. Be the guy sitting at the bar next to them. Build a relationship slowly and easily. Be personal. Be transparent. Use everyday slang. Try to put them at ease. The key is to get your prospects’ trust. Your prospects will keep reading your stuff because they like it, it’s funny, it’s informative, and they can relate to it. This is the best use for autoresponder marketing. · For people who’ve already bought from you, it’s a little different. You most likely already have some kind of relationship with them. And you’re trying to deliver content, information and additional offers to them. Even a link to a new blog post. You want to establish yourself as the savvy expert with these emails. These are not usually autoresponders but they can be. You want to establish yourself as the go-to source for whatever you offer. You know your niche inside out. But you want to talk to your readers like an 8th grader. Not because they’re not smart. But rather that’s how most people talk. And you don’t want them to have to think too much. Always remember, an autoresponder … or email … isn’t a sales letter. But there are links back to some sort of sales message … a sales page or a video. And the goal is to get the click back to that message. Using autoresponder marketing and email marketing together is the most effective online strategy that exists. It’s the model that most successful online businesses owe their prosperity to. And continue to. Email isn’t going anywhere. In fact, its use is exploding. Email accounts now total 4.2 billion worldwide and will blow up to 4.9 billion by 2017. Triple Facebook and Twitter combined. And remember, an email address is required to sign up for just about anything. 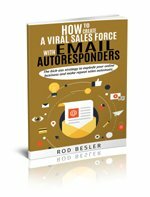 Now how to write an effective autoresponder or email series … a series that gets the click … is another subject.